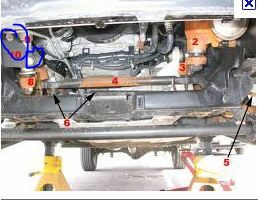 HowToRepairGuide.com: How to remove Chevy idler arm? To remove idler arm its not very hard. I will provide you idler arm removal diagram.That will give you exact idea ,on how to remove the idler arm.Its fitted on bolts. Take the bolts out of 9 and 10 that are circled and take the nut off by the right arrow for 6. This diagram should help you. How to Service Ball Joints on Car? How to Test and Replace Ballast Resistor in Car? What is Barometric Pressure Sensor? How to Replace Drive Belt Tensioner? How to replace Engine on Acura Car models? How to replace Radiator on Acura Car models? How to replace Thermostat on Acura Car models?